I wasn’t one of those kids. Trouble starts when we’ve had a negative experience time and time again. Chinese food is one of those experiences. I spent a couple of years sharing a classroom with 20 Chinese students. Of course, the ones I really liked were the ones who fed me. Every one of them had brought a rice-making machine with them from the other side of the planet. They were deft at finding the ingredients that would match their recipes. And they cooked with love and nostalgia, often mentioning their grandmother as the original source of a dish they were preparing. I don’t remember all the dishes. Some of the names were unpronounceable to me. There were nights when I was coerced into drinking rice wine out of a breakfast bowl and that tends to play tricks on your memory for a few weeks. What I do remember is that the textures and flavours were surprising and sometimes very hard to initially accept for a stupid Westerner like myself. But I braved the more unusual aspects, determined to try as much as I could and broaden my textural and olfactory horizons. And as a result, I quickly became a fan of home-cooked Chinese food. Later on, eating food at typical Chinese restaurants in Europe was inevitably disappointing. Blobs of chicken in soggy batter and radioactive sauce don’t in any way do justice to the food that a billion people on the planet call their own. I tried quite a few, every time chasing the real deal, but I was very often unhappy with the result. Take-out tends to be worse. By the time food makes it home, it has turned into a brightly-coloured goo, with little to tell the meat from the sauce. So, when asked if I like Chinese food, my reply is that I’m sure I will when I get to travel to China. I’m not excluding anything. I’m deferring judgement. Then I started to hear reports about a Chinese takeout called Yufu. Its location is listed quite cryptically as ‘San Gwann Industrial Estate’. Miserable weather helped the Yufu cause. Staying in has its merits. Service is poor because I’m the one usually taking care of it and I’m driven by haste rather than etiquette. On the bright side, however, I do get to tap into the stock of beer and wine in my fridge and listen to music I actually like without having to clean up a kitchen full of pots and pans. So, I hopped onto the site and placed an order. I did this before lunch and ordered when quite hungry, knowing full well that I’d over order. The ordering process is easy and straightforward. 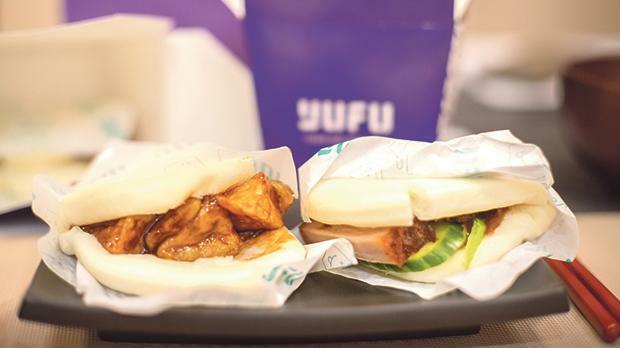 Yufu have invested smartly in the ordering experience and this serves them in good stead. It is their equivalent of the front-of-house and they depend on it as their chief method for interacting with customers so a hassle-free experience is a boon. As the day progressed, a third hungry biped added herself to the meal so I tried to add to the order. Uncertain about my ability to do so I just called Yufu. The man who picked up the phone was great about my request, took my order, assured me all would be fine and wished me a lovely meal. They’re great both online and offline. The delivery guy called me exactly on the minute I’d requested the order. Swiss time is so uncommon on our islands that all three of us were thrilled. One huge bag contained all our food and simply feeling its weight reminded me I’d ordered for eight. The packaging shows that this is not a Chinese restaurant that does take-out on the side. The humans behind Yufu have crafted the experience specifically around this method of delivery and the packaging is just perfect. It’s attractive, looking really smart with fancy branding and all sorts of visual treats to turn your dinner table into a Chinese restaurant for a while without it looking tacky. That’s only a part of the story though. The cardboard boxes containing rice and noodles are shut tight and include those side flaps that you can part to turn the box into a deep plate. The other courses are in sturdy trays with heat-sealed plastic lids keeping everything watertight so there’s not a soupçon of mess in the bag. The temperature is retained as well. Even without tasting a bite, we quickly realised that these guys had really understood what this experience is all about and crafted every detail to match. A bow of respect is headed their way for all this. We ate in an order we tacitly agreed to. The steamed bao buns would need attention first to keep the steamed bun as light and fluffy and elastic as it was when it arrived. This is quite the well-executed bun. We tried to nit-pick really, observing that the buns had stuck to their retaining paper in some places. Then we tasted the aubergine bun and felt foolish to have doubted this Hirata gem. Aubergine is a hugely mistreated vegetable. It loses all its sweet, mildly tannic and sour structure when too much is done to it. This had been dealt a respectful touch and tasted just as you imagine aubergine to taste. This might sound like a mild compliment but I mean it well. A central ingredient should shine and this one did. We followed these with pork dumplings that show unusually careful execution. Their innards are usually an indeterminate mush that tastes of cheap sausage. These dumplings have been stuffed with pork and cabbage and onion so all three are present and having their own say. The pork belly was a classic, with slow-roasted pork dressed with hoi sin for sweetness and salt and fresh spring onion for crunch and zing. Left for last is the chicken thigh that’s properly spicy. The heat is countered with crunch and freshness of cucumber and coriander. Having tasted all three, we agreed that the aubergine was the surprise star of an unexpectedly good show. The ribs are presented in a very generous portion. They’re cooked to a juicy tenderness and are properly salted but the sweet presence of plenty of cinnamon in what I presume to be five spice is what places them firmly in the East. Korean hot wings were a little overcooked with a sticky, sweet sauce and sesame seeds. The sweetness hits first. So much for Korean, I initially thought. The sweetness leaves your mouth quickly though, and is replaced by a lasting, spicy and hot finish. I see what you did there, chef. The crispy beef is very crispy to the point where it is practically desiccated. Which is the point of crispy beef. I never order it for this reason but the one who wanted it was after a vehicle for sticky sauce and sesame seeds so it did the trick. The Yufu chicken is tender inside and crisp outside but not as crisp as I’d expected it. The sauce is lovely, with plenty of ginger coming through, and it’s served with chopped veg of the type that’s allowed plenty of texture so all the crunch and the flavours of onion and bell pepper are front and centre. Once again served as quite a large portion, the pork belly is tender and steeped in a richly savoury and almost perfumed sauce. This cut works well in smaller portions – there’s too much fat in a serving this size as a main course for one but it is perfect to share as an add-on. The steamed rice is just the way I like it, light and yet clumpy so eating this and the rest of your mains with chopsticks is eminently possible. The noodles are also lovely, with plenty of soy sauce, so the fermented, salted mixture a great vehicle for the rest of the food. There’s more in the form of mange tout, onion, shiitake, bean sprouts, and fresh coriander in there too. We paid €60 for the meal and left about two thirds of it. Two of us at table that night are properly big eaters and the only consolation for stopping when we couldn’t eat any more is that we had delicious left-overs to look forward to. I never thought I’d say this. I’m looking forward to the next time I can have a night in with Chinese take-out. Thanks Yufu, for changing my mind.